I am teaching a Geometry & Spatial Reasoning course for Drexel this semester for their math masters program for teachers. Absolutely love it because I am learning so much from my students/peers, but because it really is bringing home the importance of prior knowledge to help build connections and real-world connections in helping students learn versus memorize, and construct and reconstruct based on their ability to make connections. My students, who are a mix of very new math teachers, experienced teachers, and even some career-switchers still in the early stages of teaching, are having this great discussions on the importance of using prior knowledge to help student make their own connections. Some have been doing this all along, but others, as they themselves struggle with some of the geometric concepts we are ‘learning’ (relearning in some cases), are coming to understand the value in helping students use what they know to build on and connect to new information. Makes it easier to recall, and builds a confidence in students that when faced with an unknown situation/problem, they have the skills and confidence to look at it, break it down or add in things to make the unknown familiar and then look for and make use of structure (see what I did there….Common Core Math Practice #7!) to help reach a solution or develop a new conjecture/conclusion. In Fig 1, we have an inscribed angle and its intercepted arc a. How could you show that angle 1 (the inscribed angle) is half the measure of it’s intercepted arc? Here’s where students need to make sense of this structure – what prior knowledge can they use to help them? In Fig 2, they add in a radius (auxiliary line), because they know all radii in this circle (any circle are equal – doesn’t change the original inscribed angle….but now – we have a triangle and a central angle (angle 2). What do they already know? Well, they know the central angle 2 is the same as the measure of the intercepted arc, which is the same intercepted arc as angle 1 (inscribed angle). In Fig 3, students are looking at the triangle created and using prior knowledge – we can mark the two radii equal, making this triangle an isosceles triangle, which they already know from prior knowledge has two base angles that measure the same (angle 1 & 3). Angle 2 is an exterior angle to the triangle, and angles 1 & 3 are remote interior, which they know from prior knowledge sum to the measure of angle 2. Since angle 1 & 2 are equal (isosceles triangle), that makes them each half of angle 2 (Sum divided by 2). Angle 2 is equal in measure to the intercepted arc, so angles 1 & 2 are each half of that, so the inscribed angle 1 is half the intercepted arc. Fig 4 shows that the relationship holds true even if you change the size of the inscribed angle. This is of course just one example for an inscribed angle, but they can then use this to show that inscribed angles that are not going through the center of the circle have the same relationships – ie add in auxiliary lines, use linear pairs, or triangles or other known things to help make sense and show new things. Prior knowledge, connections – they really matter. As teachers, it is our duty to make sure we are modeling and helping students use what they know to build these connections and see the relationships. It takes deliberateness on our part, it requires modeling, it requires setting expectations for students till it becomes a habit (habits of mind) to look for and make sense by pulling in previous knowledge. – Use coordinate geometry to represent and examine the properties of geometric shapes. – Recognize and apply geometric ideas and relationships in areas outside the mathematics classroom, such as art, science, and everyday life. This activity uses the Prizm Graphing calculator and picture capability to help build understanding. The kinds of questions and connections to prior knowledge that can be asked of students just by looking at the image are pretty endless. What relationships do you see (i.e. lots of diameters, or straight angles, lots of central angles, all the angles are 360, are their auxiliary lines we could add to find the areas or relationships or angle measures, etc.). If you look around, you can probably find a real-world example of most math concepts your are working on with your students. Show them pictures, show them real objects they can get their hands on. Start asking questions. Ask them what they recognize or think they already know. Ask them if they could add something or take away something to see a familiar object/concept. How does that help them? What relationships and connections help them get to something new or interesting? My Drexel course and student are reemphasizing for me (and them) the importance of prior knowledge to help build connections on a continuous basis, all the time, every day. It helps students think mathematically and consistently use vocabulary and math concepts to deepen and create new understanding and relationships. It also promotes logical reasoning and problem solving – win-win! I never taught mathematics beyond Geometry at the high-school level, even though in theory, I am certified to teach all mathematical subjects through Calculus for K-12. I loved teaching middle school concepts and then Algebra and Geometry when I went into the high schools. What tends to happen, as most teachers can attest, is that the subjects you begin teaching when you first start out tend to be the ones you stick with throughout your career. Especially if you are good at it, which, I believe, I was very good at teaching Algebra and Geometry, especially to struggling math students. This is because I focused so much on conceptual understanding and hands-on learning, technology integration (Sketchpad & calculators) and diversifying instruction. Often times, the decision on what subjects you teach is not actually up to the teacher -it is an administrative decision based on number of students, subject needs, and other factors. But – teacher subject assignment becomes ‘tradition’ – in my 15 years in the classroom, which included 4 different school districts, I can honestly say that most teachers (more true in High school) taught the same math subjects year after year. This consistency in what teachers teach may be good, may be bad, but it is the reality. I can only speak for myself, but I do know as a result of my own personal ‘teacher tracking’, I am less confident in my abilities with higher-level mathematical concepts – i.e. Algebra 2, calculus. Not because I never learned it, but mostly because I never taught it, and as years go by without interacting with these mathematical concepts, the less you remember and the less you can do. Math is a language, and if you don’t use it, you lose it. Could I teach it? Sure. But not until I thoroughly reviewed and relearned it all. All I can say is thank goodness for Khan Academy when my daughters were going through Calculus! One of the things I am doing as part of my work with Casio is learning more about what the calculators can do to support student learning, and as a result, I am relearning some math concepts I had forgotten and/or not seen in a long time. And when I say long time, I mean not since my college days, so we are talking a good 25+ years ago (yikes!). In prepping for NCSM/NCTM in Oakland and San Francisco in the next couple of weeks, I have learned some cool things that the Casio Prizm can do which are easy for students to do, visually appealing, and dynamic. Something that engages students in complex math quickly and allows them to explore and investigate their conjectures and focus on problem solving, not just calculations. One of these is finding the area between two curves, which, I will admit, I definitely did not remember and still am not sure about, but it is a concept very much explored in calculus. I do remember lots of calculating – by hand – which can become quite cumbersome. While it is important to understand the process and where these calculations come from and why they are necessary, having a visual of what area between curves means, looks like, and being able to show the constraints, etc. provides a powerful tool for helping students grasp and understand all the mathematics going on. With that in mind, I wanted to share how to find the area between two curves using the Casio Prizm (mainly because it looks pretty with color, but you can do this on any of the Casio graphing calculators) and compare it to the same process on the TI-84+ CE, again, because color looks prettier, but you would follow same steps on TI-84+. (You might ask why I always do a comparison – the reason is TI seems to still be the prevalent calculator in schools, more out of habit and familiarity than anything else. I like to show – when possible – the difference, because students should be using technology to support their learning and using technology that is going to make that process more efficient and understandable. We want them to get to the deeper meanings and connections and not get bogged down in trying to remember steps/keystrokes – having used both, I just find Casio more user friendly, not to mention cheaper. If no one knows there are better options, then tradition and familiarity win out even if it’s a disservice). The Election Process – Confusing process but applies very real-world math! I will admit that I find the U.S. election process very confusing – primaries, caucus’, delegates, voting. With the Iowa Caucus’ last night I actually learned something I didn’t know before – that Democrats and Republicans hold their caucus’ in very different ways. Democrats actually physically move around the room until there are viable candidates (those with over 15% of the vote) where as Republicans do secret-balloting and the percentage of votes for each candidate determines how many delegates they receive. I found this great article that helped me understand things a little better – “Caucus math: An NBC Primer” by Carrie Dan and Mark Murray. Basically, in a nutshell, here’s what happened last night at the Iowa Caucus’. At least I think….I could still have some misunderstanding, I admit. Democrats: At each caucus site, Democratic attendees physically went to their candidates ‘corner’ to show their support – i.e. O’Malley corner, Clinton corner, Sanders corner and an ‘uncommitted’ corner. Attendees can speak out and try to convince others to come to their side, and after all the debate and moving about, a final count is taken for each candidate. Based on the total number of attendees, a percentage for each corner was calculated, and if any candidate did not have at least 15% (making them a viable candidate), then that candidate was out, and their supporters could move to either of the other candidates or go to the uncommitted corner, and new percentages calculated. Based on all the caucus sites, the number of delegates awarded to the candidates is their percentage times the number of available delegates. So, according to the results last night, Clinton and Sanders had a virtual tie, with Clinton getting 49.9% and Sanders 49.6%, and O’Malley only .6%. This means Clinton gets 22 of Iowa’s 44 delegates, Sanders gets 21, and apparently the last delegate is “uncommitted”. Republicans: At each caucus site, there is a set number of delegates being fought over that adds up to the total Republican delegates for the state (there are 30 Iowan Republican delegates). A secret ballot is cast, and a simple formula is used to determine how the delegates are divided up for that site/district. Basically, the formula is: #of votes for each candidate at the site x ratio of delegates for site/30. There is rounding done and each candidate ends up with a portion of the available delegates, which then, when all sites report, give a grand total for each candidate. Last nights results for the Republicans are as follows: Cruz, 8 delegates; Rubio, 7 delegates; Trump, 7 delegates; Carson, 3 delegates; Bush, 1 delegate; Paul, 1 delegate; and everyone else, 0. But this is just a small blip in the overall race to get delegates, which then determines who eventually becomes the official candidates running for President for each party. It is a long, confusing process but interesting! And then we have the race for presidential votes and the electoral college after that….. My point here is look at all the math!?! And it’s real-world, and it’s happening right now and has an impact on students lives, so it’s relevant and interesting and can be a great source of real-world application and learning in your math class. Why not today in your classes (or sometime this week), hold a mock class-caucus? One the Republican way, and one the Democratic way. See who the winners are based on your class results. Discuss the process – is it fair, unfair? What’s the math? And as each primary/caucus comes along, involve your students and do the math. I just want to plant a seed. Explore with your students some of the math involved in the election process, no matter what age/grade you teach. Getting students involved in our country’s electoral process in a way that lets them apply what they are learning and feel a part of the world around them can only be a good thing. Hopefully, down the road, it will help them become interested, informed and voting citizens. 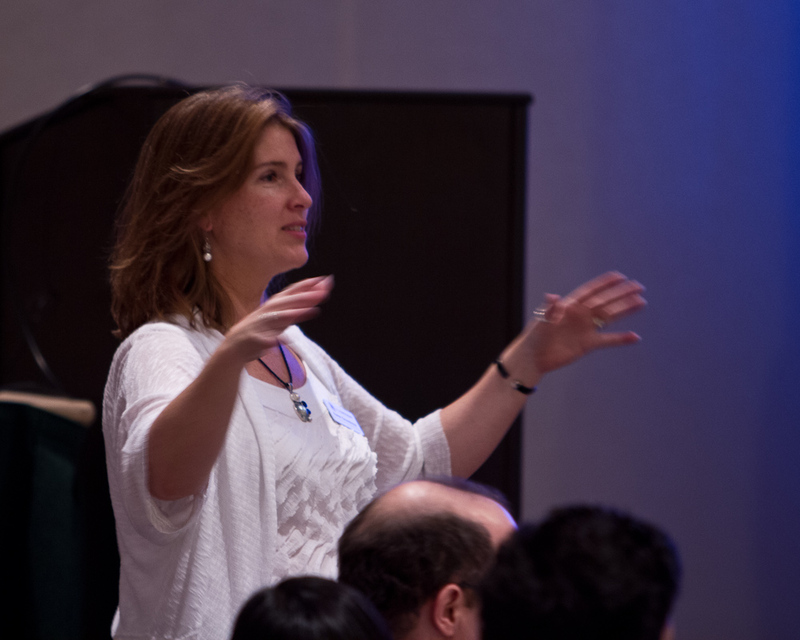 With so many different options for educators to connect – through Edcamps, Twitter Chats, Online Education Meetups, Virtual Conferences, to name a few – you might think regional and national face-to-face conferences are not relevant. Wanta bet? nce I’ve been to an NCTM, as I took some time off while finishing up my doctorate studies. If I were to gauge my feelings regarding the upcoming conference, I would have to say I am a little nervous, a little excited and mostly thrilled to get to see some old friends, meet some new friends, and connect with math educators again. This is what is relevant about these face-to-face conferences – the connections made between like-minded educators. Don’t get me wrong – I am a HUGE proponent of virtual and online professional learning opportunities. I learn so much from Twitter chats I participate in, such as #edchat, and I think online discussion forums and virtual conferences are valuable because of their ability to provide anywhere learning and affordability for those who cannot travel to these face-to-face options. Edcamps are powerful in their focused, participant-led learning. 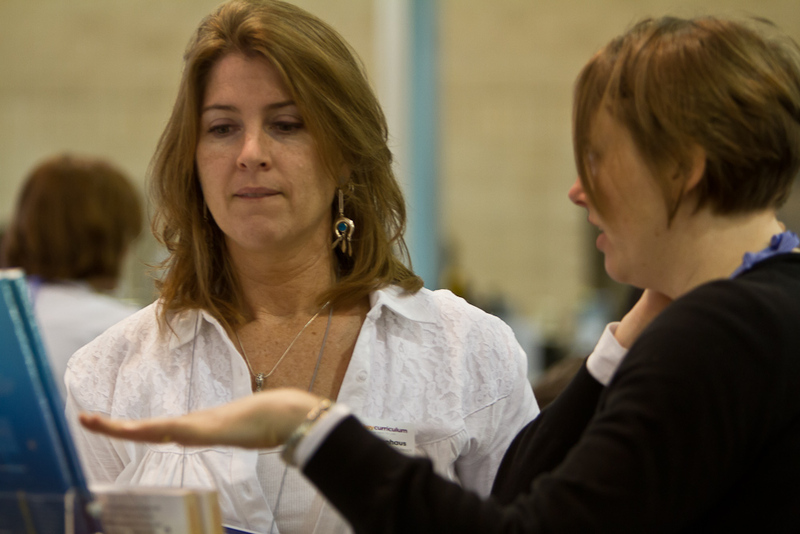 But – face-to-face conferences, like the NCTM Regionals and National or any of the content-focused conferences that are out there, like ISTE, or NSTA, provide a cornucopia of possibilities and connections. I remember my very first NCTM conference as a teacher. It was in Minneapolis, 1999. I’d been to many local and state conferences up until that time,as both a presenter and participant, but 1999 was the first time I went to a National Conference. I remember being overwhelmed at the sheer number of presentations to choose from, and then completely blown away by the Exhibit Hall. (Who knew, many years later, I would actually be a vendor in the Exhibit Hall)? Someone gave me some great advice – pick a focus, and choose your sessions based on your focus. I was teaching several sections of pre-Algebra, so I decided that was my goal – gain some new ideas to bring back to my classroom. Honestly, I don’t remember what specific sessions I went to, but I do remember getting so many ideas and being so pumped about trying some new things in my classroom. I went back to my school with all these ideas and activities to try, and was already planning for the NEXT school year. It was a long time ago, but that feeling of “WOW, I am going to be the best teacher ever now!” was very memorable, and its a feeling I still get when I attend conferences and see or hear something that gives me new ideas on how to improve my own teaching. Being surrounded by other educators, doing the same thing as you, helps rejuvenate you. We are stronger together. Pick a focus, and choose sessions to go to based on that focus. Otherwise, the sheer number of choices can be overwhelming. Spend some time in the Exhibit Hall, but keep your focus in mind. The Exhibit Hall can be overwhelming – so let your focus guide which places your stop at, what resources you look for, and what questions you ask the vendors. In sessions, make an effort to introduce yourself to those at your table/around you. You will gain insight, new ideas, and connections if you do so. It is always interesting to find out what others are doing in other areas of the country. If you end up in a session where a) the presenter is not so stellar; b) the information is not new or relevant to you; c) or you realize it’s Not what you thought, then leave. Do NOT be embarrassed, afraid, or worry about hurting the presenters feelings and end up wasting an hour or more of your time. Get up, walk out. As a presenter myself for over 20 years, I realize that sometimes what I am saying is not of interest to those in the room for whatever reason – I am never offended when someone leaves. Life’s too short to waste your time. Sometimes those titles are not descriptive enough and its easy to end up in a session that was not at all what you thought it was. Leave, as unobtrusively as you possibly can, and go somewhere where the learning is relevant to your needs. Spend some time seeing the city in which the conference is being held, but don’t forego the conference in order to only sight-see. You are missing incredible opportunities to learn from other educators. Any of you out there going to Atlantic City this week, I hope to run into you. Please stop by the Casio booth and say hi – if I am there, I would love to connect! Booth #415. While in Japan (see my first post) the R&D folks at Casio were showing the new EDU+ app for smartphones that reads the QR codes from the ClassWiz calculator. My first reaction was “cool!”, my second reaction was “why?” since, as I thought at the time was why would you need a QR code to get to an online graphical representation of the data from the calculator when you could just use a graphing calculator? But – a light bulb did go off as I played with both the calculator and the app and thought about schools I’d been to. I realized the whole purpose of the QR code is for those students and teachers who do not have graphing calculators, for whatever reason – i.e. grade level (they are in elementary and early middle school for example), cost prohibitive, or just not an option. The ClassWiz calculator, a scientific calculator, is new to the U.S. market this August, and is very cheap (about $27), easy to use, and can create & display graphical representations via QR codes, so an added feature that teachers and students can utilize. It’s a nice option for showing graphical representations quickly when other tools are not available. Let me demonstrate how it works using the ClassWiz Emulator and some real-world data I got from the eeps Data Zoo (a fun place to get some interesting data to use with students). I thought the Roller Coaster Data below was interesting. I am going to do a very simple example, so I created a table to compare the largest drop to the length of the coaster. I then chose the QR code button, which generated a QR code. Since I was in the emulator, I could just click the QR code and go directly to the visual representation on the internet. But, if I’d had my smartphone and the hand-held calculator, I could have used the app to scan the QR code and create the URL for the visual representation. You might be asking yourself why go to all this work if you are going to have to go on the internet anyway? Why not just use an internet graphing calculator? True enough – you could do this. However, the reality is, most students in classrooms do not have access to computers and internet (only about 1/3 of schools have regular access to mobile devices such as laptops & tablets, for students)(see previous post). Students at the younger grades usually don’t have access to graphing calculators. The majority of the time, classrooms have the teachers computer with a projector set up, relying on whole-class demonstration. We want students hands-on, collecting their data and entering their data, which means students with the calculators. And then, yes – have them plot their points and sketch their graphs. But – how great, if the teacher and students can quickly generate a QR code right on their calculator and the teacher can pop up a visual of the data right away and have a meaningful class discussion about the relationships students see, what might be the best type of fit for the data, should the graph go through zero and what’s the meaning of that (just to name a few questions)? Students can change the data, or compare different data, generate new QR codes and compare all these different graphs. The QR code functionality of the ClassWiz is just an example of how to expand the capabilities of the technology you have in your classroom. Another resource that allows students to explore and understand mathematics.